We’ve spent these last five weeks taking apart and looking more closely at each of the senses. Now, it’s time to go back to the beginning and reassemble all the bits and pieces that we have uncovered. Moving through these senses once again, the reminder to open your sense of Smell to receive the odors that are around you and allow them to stir the memories associated was also the call to reach back and keep those memories of joy and comfort continually alive and vibrant while creating new ones. Mark the change in the seasons using your sense of smell. The smell of Fall flowers and burning leaves are vastly different from the flowers of Spring. And the fires of wood in a fireplace in the Winter have a deeper aroma than those of burning leaves. The smell of your lover’s freshly washed body and the odor of sweat from a challenging work-out stir our emotions and draw us more deeply into awareness of the present moment. The sense of Sight is what drew you to this blog and series of writings. Something you saw attracted you to read more and the words on the page stimulated within you a curiosity to know more. Taking in the sights, means exactly that! It is a way to connect and become part of what is occurring and evolving as you witness the glory of the event. Many people are uncomfortable with making eye contact. I find it to be the most enjoyable of experiences. There is so much you can learn about a person by looking them directly in the eyes. There is so much they can glean from you if you do not look away. Eyes are one of our most expressive of features so allow them to take in and express what is being seen. Allow yourself to react and respond to what you are seeing. Our minds are capable of holding many images; each serving as a reference point for a specific set of or singular experience. Open yourself up to adding purposefully to that storehouse and at the same time expanding your own world-view. Perhaps one of the most important of the senses, Touch is the opportunity to merge and co-mingle with another human, animal or an object. In our current society, touch has many layers of meaning and we get lost in the analytical nature. Technology has created a type of disconnect that is masked by the perception that we are actually more in “touch”. In reality, what is grossly missing from that equation is the personal “in the presence of” moment where you can physically reach out a touch that (those) individual (s). Don’t waste a moment of “in the flesh” time to embrace, greet or otherwise touch. As humans we thrive on this type of interaction. Breakfast, Lunch, Dinner and every snack in between is a chance to indulge (not necessarily high caloric- LOL!) and take our sense of Taste on a grand culinary adventure. This is the armchair traveller at his/her finest. The seas of flavor and countries of gastronomic origin await our visit each day. The key is being mindful of the sensorial experience and offering the presence of gratitude and awareness of what we are sampling on this journey. As humans, we are privy as no other species to a banquet of foods each having their own specific signature of texture and taste. As Americans, food is in such abundance that we often forget the origins and hard work that went into its planting or feeding. Which, is why there is nothing quite as satisfying and flavorful as food we have grown ourselves or cooked from scratch. 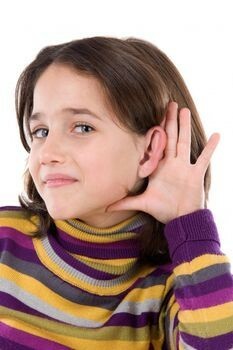 The sense of Hearing and being heard are gifts we can give to ourselves and to others. Really listening; not just taking in the sound is a skill that requires development. Hearing requires paying attention and in the case of dialogue with another, engaging sight to give further detail to what is being heard. Being heard is what we desire. Being heard means that someone else is “really listening” to what we are communicating and is giving of their time and energy in being fully engaged in the conversation. As you go through your day, make note of how many opportunities presented where you could have “really heard” what was being said. And, then make note of how many of those times you seized the opportunity for a deeper connection. Do the same sort of analysis regarding how often you felt that no one was listening to you. And, how disconnected and isolated you felt by that experience. I return to the thoughts I offered about the purpose of this blog and the call to embrace everything that is held in a physical existence….. Living fully present means engaging all of the senses in all of your endeavors; even if this is not a pleasant process. Changing a baby’s diaper is not always a pleasant olfactory (smell) experience, but the love and tender care you are offering overrides this. The other consideration is that when you are familiar with the normal smell associated with this task, anything out of the ordinary can give you a heads up on an upcoming illness. For me living in this sensorial way is to live by purposeful design. 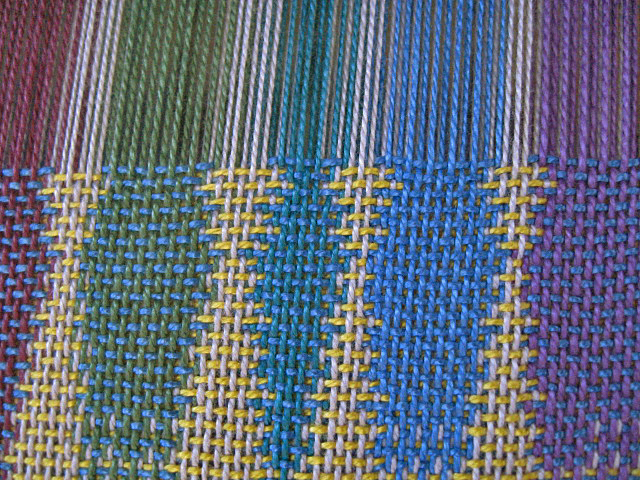 The tapestry of my physical experience is woven using the many threads that include tactile, sensorial, mental, emotional and more. The more I weave of this tapestry I am able to differentiate between what is common ground and what is disparity in my relationship with others and in the way I chose to live my life. The more I engage the physical tools I have to assess and categorize my experiences the greater the ability to determine a reaction or to response to similar experiences. And, ultimately the more I contribute to the design that is woven the more fully human I become. I hope you have enjoyed this exploration of the Senses and have gained some deeper insight on how to enhance and actively use them. Be sure to take a look at the collaborative posts in The Sacred Vessel Blog. As always, I welcome comments and suggestions about how I could have made this series more information. 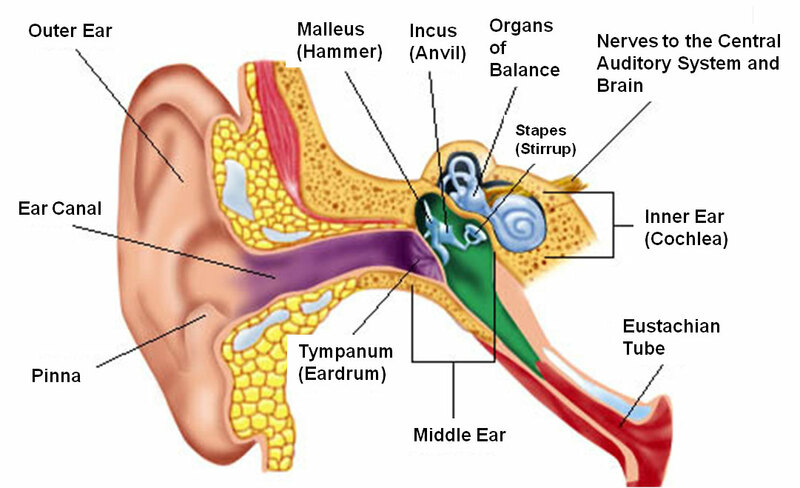 The sense of hearing is one of cultivating inner balance as the foundation of physical experience. A well-balanced ear and a well-oriented sense of hearing, possesses the ability to discern and distinguish in everything one hears truth from falseness. To hear actively is to understand through the process of receiving the emotion expressed through the words and the energy behind that emotion as a point of empathy or challenge. It is through the sense of hearing that we find our place of resonance or discord. The shrill sound of an alarm alerts us to danger. The harmonious music of a finely played symphony stirs the emotional self and can transport us to otherwordly realms. The sound of children playing and the laughter that often accompanies this can remind us of our own youthful antics or fond memories of our now grown children as they played. Cries for help pull us into the survival mode and we instinctually reach out to find the source of this distress. And, the sound of sorrow and loss moves us to a place of compassion and reminder that another’s loss and sorrow is and will be ours when our time arrives. 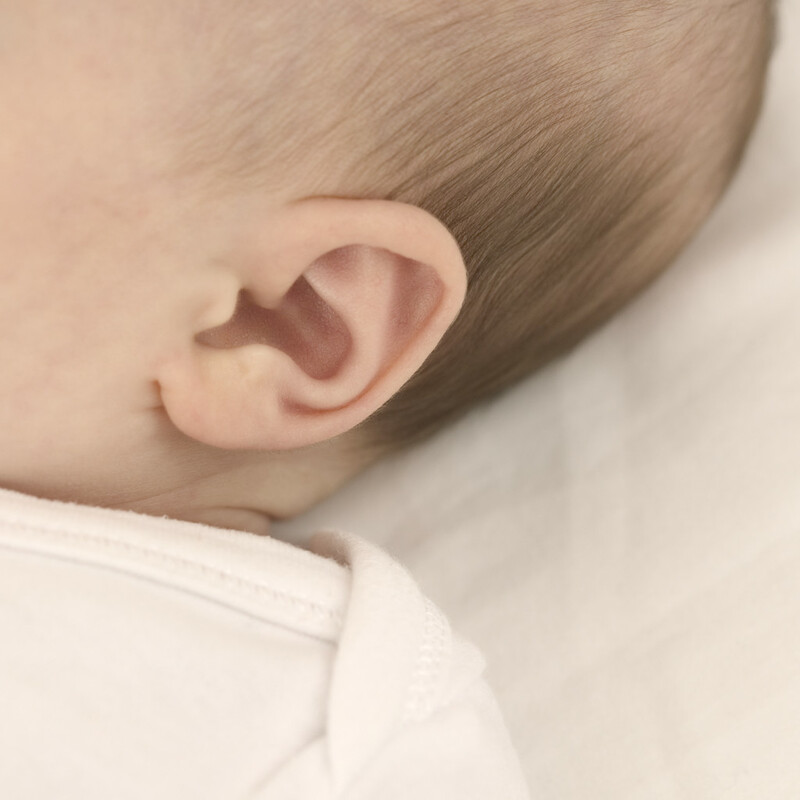 Cultivating a sense of hearing is something that requires practice. Especially in the hurried bustle of our 9-5 world we often make very little time to have truly deep listening experiences. We rarely pause to hear what is around us, unless it is of distress in nature and the luxury of bathing yourself in SILENCE is either neglected or unachievable. The true magick of hearing is in the process of simply listening and allowing all of the parts of yourself to respond. 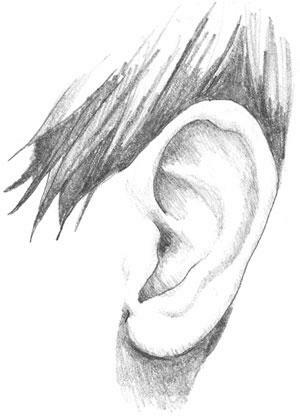 Our ears serve a marvelous function in allowing us to communicate with one another. Placement on either side of the head allows the experience of drawing the sounds from either direction into our focus of attention. In fact, this is often what can be the most disconcerting when we are in a noisy room and multiple conversations overlap the one we are trying to engage in with another. Do you remember how your Mom always said she had “eyes in the back of her head”? Well, as a mother of five children under five at one point, selective hearing came in quite handy when I had to pinpoint whose needs were greater and the direction of sound coming from that child! From a contemplative perspective I find it fascinating that our sense of balance relates to the ear. I’m sure we all can recall feeling wobbly and unstable only to find that water had accumulated in our ear causing this brief disequilibrium. This also makes me think more about the metaphoric meaning relating to how and what we chose to hear and the misunderstanding and unstable feelings of foundational connection that can occur because of this. In our daily experience, we are continually surrounded by the vibratory signature of sound, and are largely unaware of the responsive resonance of those powerful waves of vibration moving through and within our bodies. The profound inference of this statement is that when we become aware of the effects of certain sounds on our emotional, mental and active states we can use these as potent tools of self-awareness and personal growth. In example, nothing touches us to the core of our being like a piece of beautiful music and likewise, the same sensations are evoked at the sound of new life being birth and the first cries of a beautiful baby. Similarly, music can agitate us if certain pitches and rhythms are used just as that same crying baby can rub nerves raw if encountered in an already stressful state. Much of the sound and subsequently altering of our own state of resonance is transparent. The white noise hum of electrical objects, that when electricity fails brings us to the startling awareness of the real meaning of silence. The clicking of the keys of the computer keyboard as we type. The daily opening and closing of our car or house doors as we arrive and leave. The rubbing of our hands together for warmth and the swish of clothing brushing across our skin as we move about. All of these and more form the multiple gateways of sound through which we forever move as we go about our daily tasks. In the space of eventide we are still subject to sound. The rhythmic or annoying sound of breath as we move into dreamscape that becomes the gentle wave holding us at the fluctuating levels of consciousness can easily become the abrupt awakening that occurs when snoring reverberates through a quiet bedroom. The white noise of the air conditioner that aids our sleep or the all too loud ticking of the clock that keeps us on edge. All these and more affect the quality and thus level of dream state we are able to achieve in any given night. These sound patterns move cyclically and create their own geometric patterns that are then embedded within our own to form points of resonance for future reference. This is how we are often not even aware of the sounds that routinely surround us because we are already attuned to their specific signature. Think about the country dweller who is acutely aware of the sounds of nature and can “hear” the change in the seasons. Arriving in the city, that same individual is deafeningly aware of the sounds of sirens, cars, and city equipment. The city dweller barely notices these things because they are attuned to the frequency of the cityscape and would most likely say that it is “too quiet” in the country, never hearing the gentle rustle of the butterfly as it moves through feathery greenery. Now, we come to one of my favorite treasures of being able to hear- Music. Music soothes the soul, quiets the mind and sets the listener in a space of tranquility and peace. Music unleashes the prime instinctual nature and rouses the passions, spirit and emotions of the listener to a place of alertness and action. Music inspires what will become art or a piece of great writing. Music links the atoms and cells of its vehicle in grace and fluid motion, or syncopated frenzy. Music beats out the rhythm of the heart and carries the journeyer to realms hidden and remote holding treasures of deeper mystery. Music carves its way through the energetic fields surrounding and like the ephemeral flutter of butterfly wings, lightly etches its feathery strokes; forever changing all in its path. Music is only one aspect of what is included in the definition of sound. Some may say that music is the structured pattern of sound’s rhythm. And, that when sound is unstructured it becomes noise. I believe these are merely the semantics used in an attempt to categorize what essentially moves of, and in its own accord as it recreates its own definition in response to where its energy is directed. Music is the most overt expression of sound, primarily because we are conditioned to recognize its signature of pattern and perk up in attention as the sound moves through the receivers of our auditory experience. It is scientific fact that the brain responds in accord with the signature of rhythm that is provided it. If we look at this response using the definition of artistic expression it is clear why so many of these forms of creative beauty are used to access the deeper response of the soul and elevate conscious awareness to a place of inspiration. Sound applied through the dynamics of music takes many forms and in its most structured is used as therapy to heal, calm and stimulate function because of this innate stimulation of resonance of the neural pathways to specific electrical patterns. When we engage our sense of hearing we are mapping out and responding to the vibrations that are being made as air and force meet to produce tone. Sound can have a dramatic effect on the emotional, physical and mental states of an individual. Finding a common point of resonance and then “retuning” that individual’s energetic pattern can produce healing results. Music during difficult labor can help to soothe the pain of childbirth. Cancer patients and those critically ill can benefit from soothing music being played during treatments. Specific types of music can induce trance-like states that can open the individual to deeper spiritual experience. 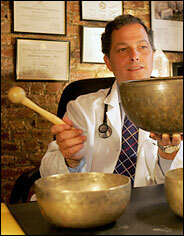 Dr. Mitchell L. Gaynor, a New York oncologist, strikes one of his Tibetan singing bowls with a mallet to produce soothing tones; he might add rice to change the sound. Dr. Gaynor, the author of a book on sound healing, considers it a complement to traditional Western medicine. The process used in Sound Healing is that of Brain-wave entrainment. The goal being to bring the body into resonance with the frequencies associated with relaxation, enhanced learning, healing and more. “Brainwave Entrainment (pronounced: “ehn – TRAIN – mint”) refers to the brain’s electrical response to rhythmic sensory stimulation, such as pulses of sound or light. When the brain is given a stimulus, through the ears, eyes or other senses, it emits an electrical charge in response, called a Cortical Evoked Response .These electrical responses travel throughout the brain to become what you see and hear.When the brain is presented with a rhythmic stimulus, such as a drum beat for example, the rhythm is reproduced in the brain in the form of these electrical impulses. If the rhythm becomes fast and consistent enough, it can start to resemble the natural internal rhythms of the brain, called brainwaves. When this happens, the brain responds by synchronizing its own electric cycles to the same rhythm. Entrainment is a principle of physics. It is defined as the synchronization of two or more rhythmic cycles. The principles of entrainment appear in chemistry, neurology, biology, pharmacology, medicine, astronomy and more. CASE IN POINT: While working on the design of the pendulum clock in 1656, Dutch scientist Christian Huygens found that if he placed two unsynchronized clocks side by side on a wall, they would slowly synchronize to each other. In fact, the synchronization was so precise not even mechanical intervention could calibrate them more accurately.” (Siever, D. (2004).The Application Of Audio-Visual Entrainment For The Treatment Of Seasonal Affective Disorder). And, in application to alternative treatment and behavioral reconditioning we see that…. Can You Hear Me Practice? These two exercises are designed to give awareness to the way in which we hear and the responses received from actively listening. The first is one that is deeply needed in our over tech society where multi-tasking is the norm. The way in which we define listening and the active participation we give to that action have changed significantly over the years; but there is still no replacement for active engagement in what you hear, how you reply and how it effects all who are part of that cycle. The next opportunity you have to sit and talk with someone, approach it from the perspective of truly listening. What type of words are they using? What energies within you are stirred as you listen to these words. Imagine that the words coming forth are waves of water. Are these gentle waves or do they have an intensity and overwhelming flow? What can you hear in the moments of pause? Do this in several scenarios with conversations that are different in nature. Try to be as fully engaged as possible in each conversation. Make a recording using your own voice and describing in as much detail as possible an object you have selected. This can be a picture, food, piece of jewelry or a garment. Anything that you can physically hold onto and lends itself to colorful and interesting description. Have a table handy, on which you can place the object and a writing instrument and journal or piece of paper to record each portion of the exercise. Sitting quietly where you will not be disturbed, lay the object on a table directly in front of you. Playback the recording of the description and simply LOOK at the object. Do not touch it; just observe and engage your sense of sight as you listen to what you have described. Pause the recording and briefly make note in your journal or piece of paper of what thoughts and feelings this portion of the exercise produced. HOLDING the object in your hands, replay the descriptive recording. 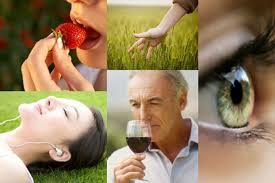 Open both your senses of touch and vision as you listen to the description presented. Replace the object on the table and again, record your impressions. Replay the recording. Holding the object in your hands once again CLOSE your eyes. Open fully to the sense of touch as you listen to the recording. This action may provoke an inner screen visualization of the object. Allow the impressions and sensations that wish to present themselves to do so. When the recording has ended, place the object back on the table and record these impressions. Finally, IN SILENCE, pick up the object. Hold it in your hands. Look at it fully and draw into your mind as much detail as possible. Record your impressions of this experience. Now, take a look at what you have written of the experience. Where did you feel the most engaged to the item? What actions and combinations of sensation did you feel gave the fullest experience of the object? What gave the least information? Try this exercise with a variety of objects. 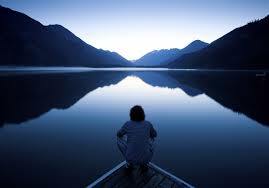 Some things in our world lend themselves more fully to the silence. Others draw us into their patterns more fully when enhanced by sound and vibration. Sound Bytes: Indulge yourself in these.. This five-part posting will take a closer look at each of the senses that are part of our greater learning and growing experience. Each of the five senses plays a significant role in how we process the information of our human experience and these lessons serve as the foundations of our use of sensation in ephemeral and spiritual experience. Each contributes a specific energy and working collaboratively they offer the keys to memory, expansion of consciousness, engagement in the physical world and doorways to the inner planes of wisdom. 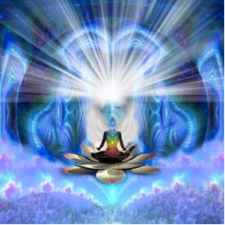 There are collaborative posts speaking to the Spiritual overlays of each of the senses in the Sacred Vessel Blog that may be accessed the week after this posting.